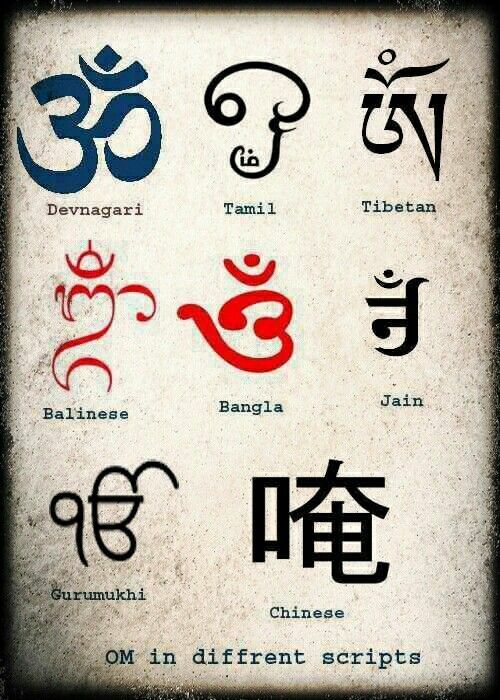 The Word was ॐ, AUM or Amen, the physical world is the result of the resonance of the sound when it, in the beginning, was recited. AUM represents Brahman-Atman, and the three roots of the syllable are A + U + M.
The sound is the body of the soul, and it manifests in three, Brahma, Vishnu and Shiva, the three Logoi. See more on the Three Logoi here: The Logos Walks the Earth. The resonance is created by the First Logos, Brahma, and the Third Logos, Shiva. The Second Logos, Vishnu, is the Equilibrium, it gives content and form to the resonance of First and Third Logos. See more on standing waves and matter here: Matter is Made of Waves One and Two. 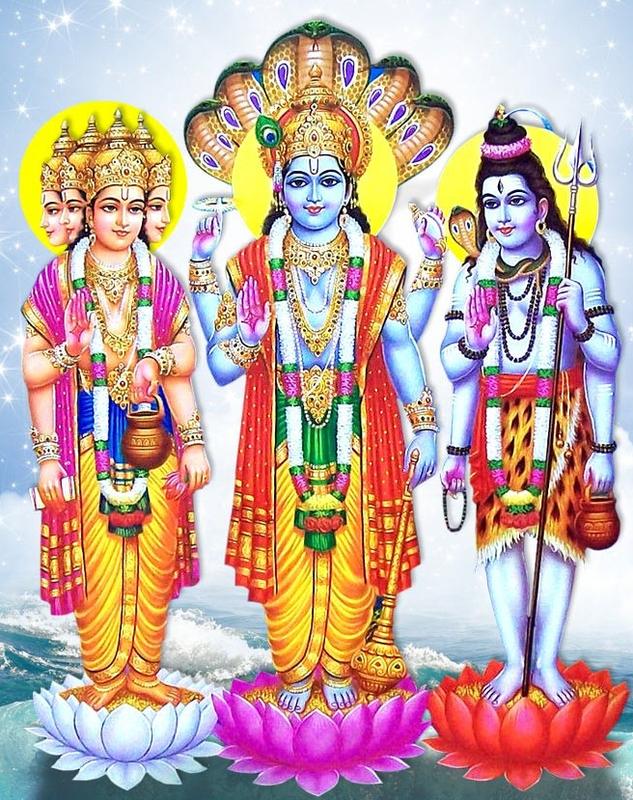 Here the Three Logoi, Shiva to the left, the body with the Three Gunas, in the top middle Vishnu, the soul, and to the right Brahma, the spirit. 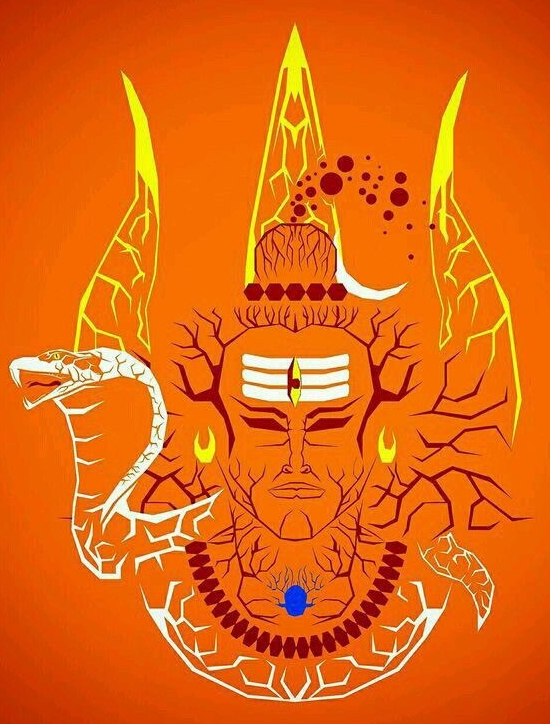 Shiva is the 3, the trident and Tilak, symbolizing the three Gunas, Tamas, Rajas and Sattva. 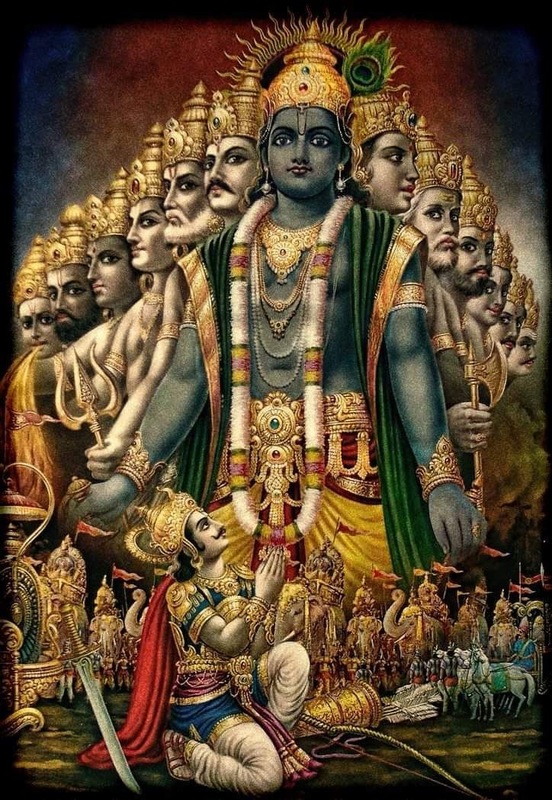 Vishnu is the U and Brahma the o in the top. 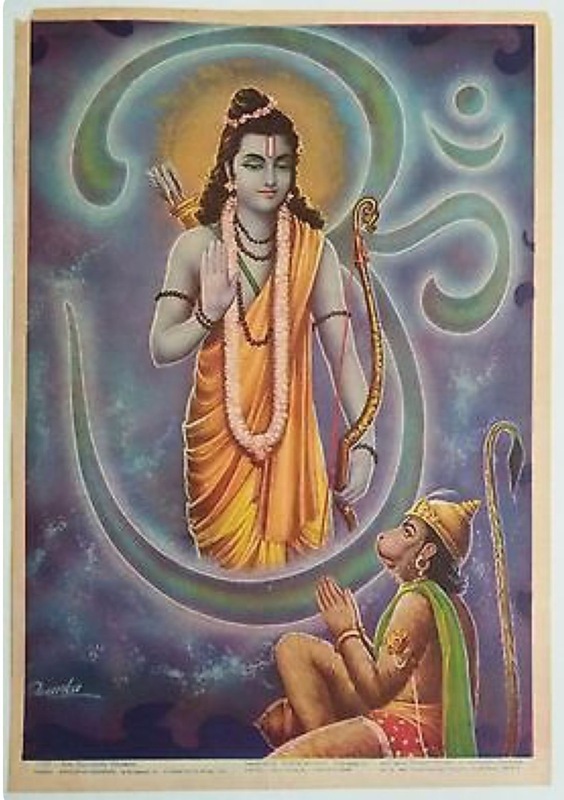 To the right we have the I AM, Atman. 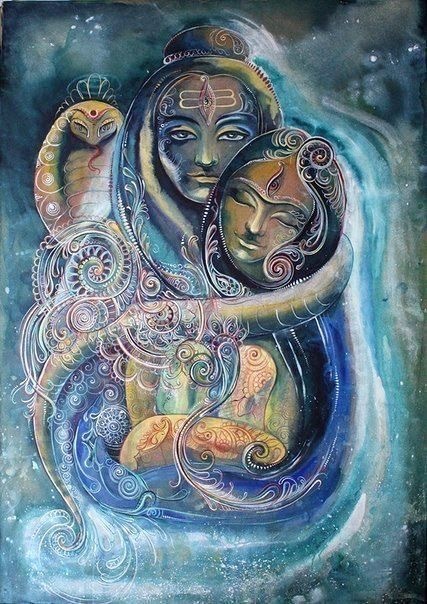 The serpent connected to the trident is also a symbol for the Third Logos, the Kundalini powers, the connection between Earth and Heaven. The infinity sign is also connected with reincarnations into the physical, the development in time. Here the Bengali AUM in different forms. In the second the bull symbolizes Shiva. The third eye symbol has the symbol of Shiva (3) inside the triangle, and the triangle is the symbol for the Holy Grail, the third Logos. Below I have taken the symbols on the left from a page calling themselves Scientific Research on “Hinduism Kamasutra”; they have many interesting views, although my conclusion differs. The symbology is the same as the grail. The symbol for Christ is interesting, A symbolizes the First Logos, the Father, the First Creator. Omega is the symbol for the Third Logos, the Holy Spirit, the third and future creator. P symbolizes the Second Logos, the Son and current creator. 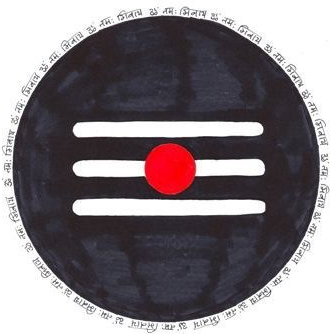 Krishna’s Tilak, the symbol on his forehead, is like the U in AUM, the symbol for the Second Logos. 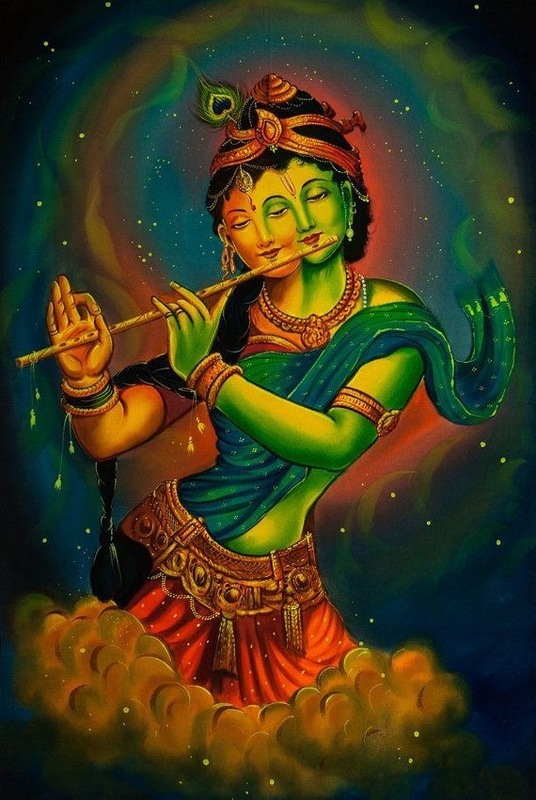 Krishna is the incarnation of Vishnu in the Etheric world, so Vishnu have also the U Tilak, and Hanuman have too. 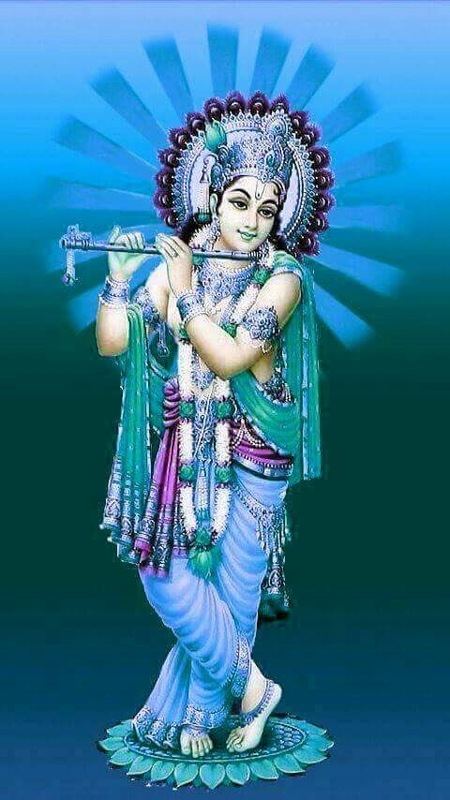 Krishna is the archetype of man, his body is Shiva, his soul is Vishnu and his spirit is Brahma, or in christian symbology, Christ has the Holy Spirit as body, the Son as soul, and the Father as spirit. Third Logos as body, Second Logos as soul and First Logos as spirit. AUM is the whole world. It’s also said to be fourfold, A + U + M + stillness or without an element, the I AM. It’s the past, the present and the future, and the fourth transcends time. Everything is Brahman, and Brahman is Atman (the Soul, the Self), and Atman is fourfold. It’s seeking the physical, seeking inner thought, seeking the causes and spiritual consciousness, and the fourth state is realizing oneness with the Self, the Eternal, the I AM. 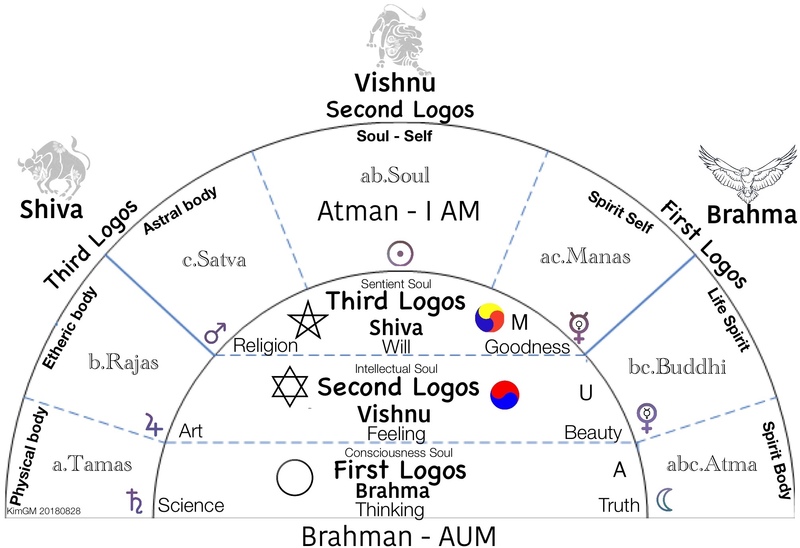 A is from Apti (obtaining, reaching) or from Adimatva (being first), Brahma, First Logos. U is from Utkarsa (exaltation) or from Ubhayatva (intermediateness), Vishnu, Second Logos. M is from Miti (erecting, constructing) or from Mi Minati or apīti (annihilation), Shiva, Third Logos. The fourth without an element, is without development, beyond the expanse of universe, the I AM. Brahman exists in two forms, the material form and the immaterial form, the left and right side. For the Sanskrit AUM we have for the trinity the “I” of the soul, the inner trinity of man. Brahma, the Father Logos is the creator of the past. 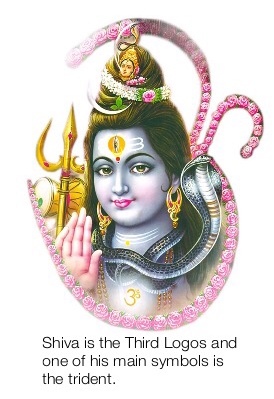 Vishnu, the Son Logos is the creator of the present and Shiva, the Third Logos, is the creator of the future. The old adepts expressed this briefly in the sacred word AUM. 1. A is the past that sounds loud and clear. 2. U is a dull vowel and represents the present. It has something of the clarity of the past and of the freedom of action of the present in it. 3. M is the indefiniteness of the future, to which every vowel or this or that action can still add something. AUM represents the Three Logoi, A the First Logos, the primal truth, U the Second Logos, the primal beauty, and M the Third Logos, the caring love. “High spiritual beings whom we call masters stream down to us. We should also know that they walk on earth incarnated in a physical body. Standing gravity waves. and 2. 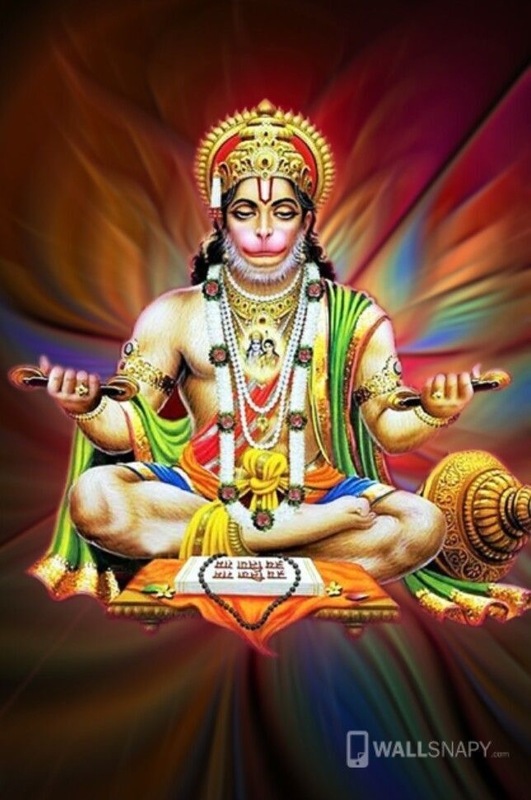 Where A is Atma, the Father, U is Buddhi, the Son, and M is Manas, the Holy Spirit, dharma. Vishnu or Krishna is often shown with seven serpents above their heads, or Krishna dancing on the heads of serpents. It’s the seven bodies of man, the Seven Planetary Powers or Hierarchies as shown in the above diagram. In Arjuna’s vision of Krishna we see the myriads of beings that are part of the full reality who Krishna really is. The picture illustrates the above diagram, the two sides of the bottom up U. “AUM. One wards off bad influences when one says it in the right way; it connects man with the creating Godhead, the three Logoi. The evil beings who want to tear men away from the Godhead can’t stand it. Rudolf Steiner, From the Contents of Esoteric Classes, Berlin, 1-29-1907. What is to be known, that I’m the purifier and the syllable OM. In John’s Gospel Christ is the Word. This is Not a contradiction! OM is a matrix of all sounds. These three sounds can be said without the tongue, all other sound can be said with these three sounds modified by the tongue. Linguistically, all audible sounds are produced beginning at the root of the tongue and ending at the lips. The U sound starts at the root of the tongue, continuing until it ends in the lips. M is the lip sound. See more on the Three Logoi here: The Logos Walks the Earth.